General Information: Kyoho grapes (literally "giant mountain grapes") are a Concord-like cross (Vitis vinifera x Vitis labrusca) between Campbell and Centennial grape varieties. Like Concord, Kyoho is a slip-skin variety, meaning that the skin is easily separated from the fruit. 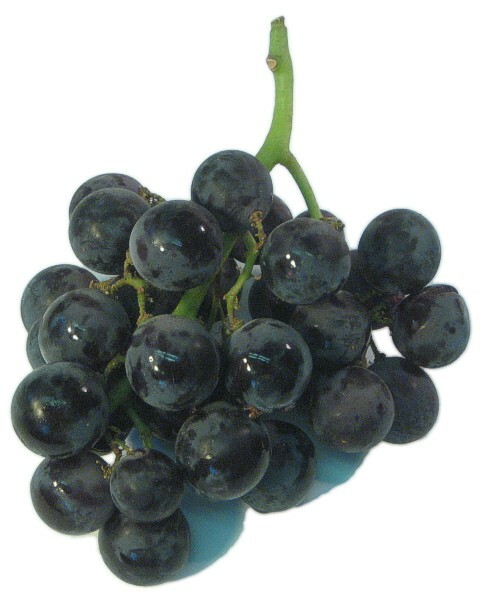 Kyoho grapes are blackish-purple, or almost black, with large seeds. While the seeds are bitter and the skin is not traditionally eaten, the flesh is juicy with high sugar content and mild acidity. Kyoho grapes were first produced in 1942 in Shizuoka Prefecture, but were not so named until 1946. They are popular in Japan, China, and Korea for its huge size and very sweet flesh. They are traditionally served peeled as a dessert. Areas of production include Nagano Prefecture, Yamanashi Prefecture, California's Central Valley, Changhua County in Taiwan, and Chile.